This listing is unique! No really - no other all-Africa rate list exists. The data comes from a fantastic resource that I've discovered - coinmill.com so don't blame me if these rates are wrong and you end up paying $400 for a coke. More money info and advice is in the Documentation section. The CFA is a fixed exchange rate currency used used in several West and Central African Countries. 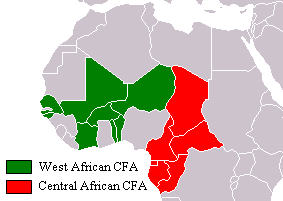 Two flavours exist - the West and Central African CFAs, and these cannot be used except in their own CFA zones.